Can I remove the heatsink/heatspreader? No. Removing the heatsink/heatspreader will void G.SKILL warranty. 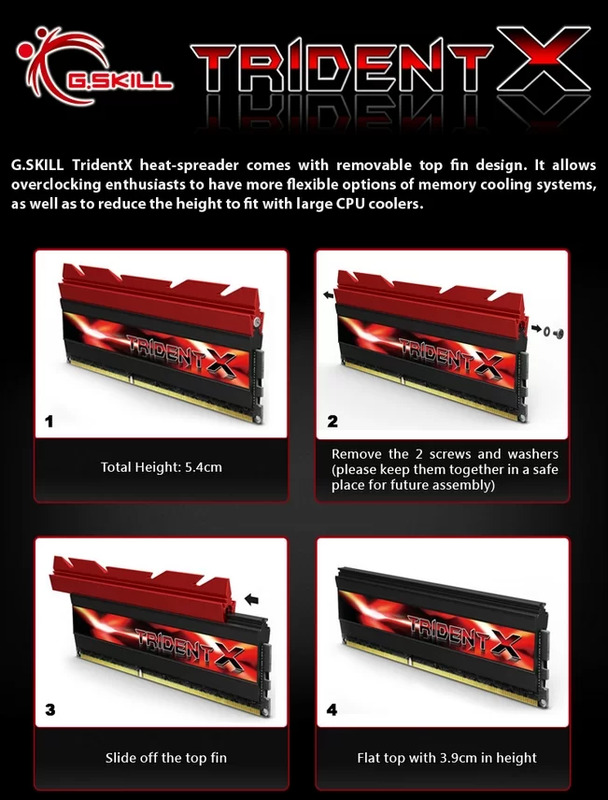 TridentX’s top fin, however, is removable without voiding G.SKILL warranty. To remove, remove the screws on the side, and then slide off the fin. Does G.SKILL make ECC memory modules? No, we currently do not manufacture ECC memory modules. How do I determine if my RAM is defective? Please use a memory testing software to test your memory modules. Memtest86+ or Windows Memory Diagnostic are popular choices. It would be best if each module is tested individually, in order to produce conclusive results. How tall are the memory modules? The height of the memory modules are listed on each of the product webpages. I just installed G.SKILL memory into my system. Why doesn’t it boot? 1) Make sure that your motherboard supports the memory capacity and frequency. 2) Clear the BIOS settings by using the “ClearCMOS” jumper/button on the motherboard. Or you may disconnect the power cord and remove the round lithium battery from the motherboard, wait 60 seconds, then put the battery back on the motherboard and reconnect the power cord. 3) Update the motherboard BIOS to the latest version. 4) Check the memory modules with a memory testing software, such as Memtest86+ or Windows Memory Diagnostic. I want to install more memory, in addition to my existing memory kit. What are my options? We do not recommend mixing memory kits, regardless of brand or model. By mixing memory kits together, there may be compatibility issues such as unable to boot or unable to operate at rated specifications. Each of our memory kit are thoroughly tested to ensure compatibility within each memory kit. And because we have not tested our memory kit with your existing memory kit, we cannot guarantee compatibility when multiple kits are used. What does “CL 9-9-9-24-2N” mean? The four numbers represent the values of each type of latency, and are listed as “tCL-tRCD-tRP-tRAS”. The fifth number represents “Command Rate”, which in this case, has a value of 2. Sometimes, this fifth number may not be listed, but our default setting for the Command Rate value is “2”. What is a safe DRAM voltage? Standard DDR3 memory voltage is 1.50V. Low voltage DDR3 is at 1.35V. Ultra-low voltage DDR3 is at 1.25V. When overclocking, DDR3 memory voltage can be set up to 1.65V. Standard DDR4 memory voltage is 1.20V. When overclocking, DDR4 memory voltage can be set up to 1.35V; or if at DDR4-4133MHz or above, then the rated memory voltage may be up to 1.40V. In general, voltage above the rated memory kit specifications may damage the memory modules over time. Please also keep in mind that higher voltage means more heat, and excessive heat will shorten the lifespan of the memory modules. What is G.SKILL memory’s naming convention/nomenclature? *You can find the capacity of each module by dividing the Total Capacity by Modules per kit. For example, F3-12800CL9Q-16GBXL = 16GB/4(Q) = 4GB per module, while F3-12800CL9D-16GBXL = 16GB/2(D) = 8GB per module. *If there is a "B" as the third letter of the series, such as "TZB" or "RKB", then it typically designates a different CL timing value when compared to the original model without the "B" in the third letter. What is the difference between “DDR3-1600” and “PC3-12800”? There are two naming conventions for DDR memory, so there are two names for the same thing. When starting with “DDR3-“, it will list the memory frequency. When starting with “PC3-“, it will list the memory bandwidth. To convert between the two, just divide or multiply by 8. For example, 1600*8=12800 or 12800/8=1600. XMP (Extreme Memory Profile) by Intel is a preprogrammed profile that you can enable in BIOS to set the correct memory settings in one easy step. XMP is exclusive to Intel platforms only. DOCP is similar to XMP, but developed for use on AMD platforms. Why does CPU-Z (memory tab) show only half the frequency speed of my memory kit? CPU-Z reports the DRAM’s operating frequency, but DDR (DOUBLE Data Rate) memory can carry two bits of information per cycle, so the effective frequency is double the operating frequency. Why doesn’t my computer detect the full memory capacity? If your operating system is 32-bits, then it cannot use more than 4GB of memory. Please upgrade to a 64-bit operating system to use more than 4GB of memory. If your Windows 7 operating system version is correct, please check that Windows is not limiting your RAM usage. To check, go to the “Run…” dialogue, type “msconfig”, and press Enter. Then select “Boot” tab and click on “Advanced options…” button. Please make sure “Maximum memory” is not checked, then click “OK” for all dialogue boxes and reboot your system. Windows 8, 8.1, and 10 has a higher physical memory limitation beyond configurable memory capacity, so 64-bit versions of Windows 8, 8.1, and 10 should not experience limitations on physical memory capacity. Why is G.SKILL’s Qualified Motherboard List different from my motherboard manufacturer’s QVL? G.SKILL’s Qualified Motherboard List is the result of our compatibility tests. This list is not comprehensive because new motherboards are constantly released. Each motherboard manufacturer’s QVL is limited to the G.SKILL memory kit they own and are able to test. This QVL list also will not be comprehensive, because G.SKILL is constantly releasing memory kits. Why is my memory kit only operating at 1333MHz or 1600MHz? If on an Intel platform, please make sure that XMP is enabled. If on an AMD platform, please make sure DOCP or XMP-equivalent is enabled. Make sure to Save and then Quit/Exit! XMP on my Rampage IV Extreme motherboard doesn't work. Help! The link went missing when we updated our website, but now is found again. If there are any further questions, please contact our tech support at techsupport@gskill.com or ustech@gskillusa.com!